EDCO copper foil is made with dead soft copper so it adheres nicely around curves and sticks nicely to your glass. This will give your finished work smooth edges and make it stronger.  Copper Backed Foil .00125 mil. 1.25 mil. 12" x 12" copper foil sheet with adhesive back. Hand foiler applies foil to a piece of glass automatically centering it. The result? An even, perfect application without bubbles or creases. So easy, you can actually foil with your eyes closed! Available in three sizes, to apply 3/16", 7/32", and 1/4" foil. 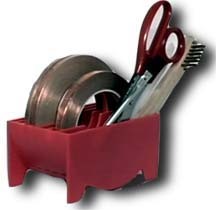 A convenient way to store seven sizes of copper foil plus scissors, burnishers, exacto knife, and other foiling aids. 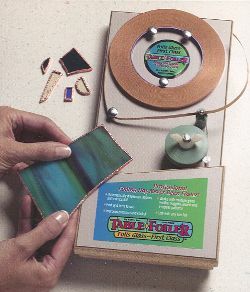 Durable plastic stick used for pressing down copper foil to your glass. Magic Cutter is the ultimate companion tool for all Table Foilers. It cuts the foil in the rollers and adjusts the roller height quickly and easily. 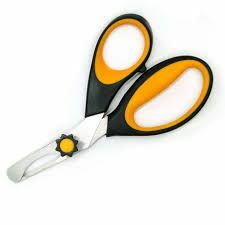 Faster and easier than scissors. The innovative Jim-Eze pattern shears for copper foil takes the frustration out of the pattern cutting process. The shorter blades and thin top blade enhance maneuvering to cut tight curves and small detailed patterns with eze. The concave lower blades clear debris and eliminate clogging for non-stop cutting. The soft comfort grip handles help to prevent hand fatigue. The blade tension can be adjusted for clean cuts through even the thickest pattern paper. Burnishing the foil on the front and back of the glass pieces is desirable for a smooth track for the solder to adhere to. It is not necessary to burnish with such energy as to attempt to form a molecular bond between the copper foil and glass. Simply smoothing out the wrinkles will suffice. Foil nuggets and jewels fast! Just roll your jewel or nugget over copper foil that lays in a track, burnish as usual, and you’re done. Uses up to 1/4" foil. This durable plastic crimper makes burnishing task a breeze. After foiling the piece of glass, slightly push down the foil on all sides and 'crunch' the corners. Then slide the piece of foiled glass through the Kwik-Crimp fingers. With one swipe, the foil is strongly adhered to the sides of the glass and the foil is ready for soldering. 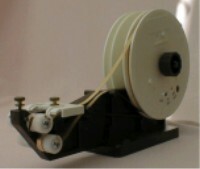 The Diegel Foiler Model 500 is a dual reel foiler which has reels that adjust to all popular sizes. The machine is supplied with rollers for 3/16", 7/32" and 1/4" foil. Though this machine does not crimp as it wraps, it does have an adjustable guide pin that allows you to decide whether you want the foil centered or set more to the front or back. You will find this feature is very important when you attempt to foil textured glass. Easy to master - you'll be foiling in no time. Take the fuss and frustration out of foiling! This portable tool dispenses, applies, and crimps foil in one smooth process. Unlike hand-held models, the Table Foiler creates a flat, sturdy work surface that adds precision and control for even intricate foiling projects. Just guide the glass into the roller and go! Works with many glass sizes, irregular patterns, various thicknesses, nuggets, jewels & bevels. Automatically dispenses 3/16", 7/32", and 1/4" foil. 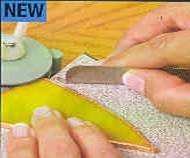 Removes paper backing. Centers and crimps foil. Two different sizes can be mounted on the machine at the same time.